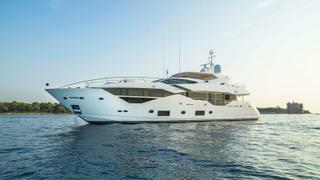 A new 35.2 metre Sunseeker motor yacht has been sold with Tom Wills at The Sunseeker London Group introducing the buyer. Built in GRP by British yard Sunseeker International, the new yacht is the latest model in the Sunseeker 116 range, built on the platform of the Sunseeker 115 Sport Yacht and improving upon this proven model. Beyond extending the overall length to 35.2 metres, the Sunseeker 116 also features an updated new superstructure design, sporting rakish and powerful-looking exterior lines. Accommodation is for 10 guests in five cabins comprising a main deck master suite, two doubles and two twins, and all cabins come with entertainment centres, Samsung television screens and en suite bathroom facilities. The interior of the new Sunseeker 116 luxury yacht has been primed for entertaining, with a large main saloon boasting full height windows, an entertainment centre including a 55-inch Samsung LED television screen and a Harmon Kadron stereo surround sound system, plus a dining room seating 10 guests. The layout of the exterior also makes this a great yacht for entertaining. The foredeck, for instance, is an entertainment hub in its own right, hosting a large hot tub, while up on the flybridge, a retractable sunroof covers a lounging and dining area. Twin 2,640hp MTU diesel engines allow speeds of up to 25 knots. The asking price of the Sunseeker 116 has been withheld.